The Pride Hotel Pune at Shivajinagar is designed for travellers who love to splurge on lavishing experiences, every once in a while. The hotel is located at Narveer Tanaji Wadi on University Road in Shivajinagar. The Pride Hotel Pune houses gorgeous rooms and suites; from plush premium rooms to well-appointed superior studios. While each room is exquisitely furnished at The Pride, our pick, however, is the magnificent Peshwa suites that look something straight out of a royal Maharashtrian Wada. We loved the mix of beige and gold interiors that goes well with cream vintage furniture, king-size bed, embroidered carpets, traditional diwans, handpicked vases, wall paintings and more. Of course, compared to other rooms, Peshwa suite is slightly high-priced and starts at INR 8,800 per night. But hey, if you want the royal treatment, you can’t complain. Speaking of luxe treatment, we hear their 24-hour coffee shop, Casablanca is a must-visit for freshly brewed coffee, baked treats and multi-cuisine buffet spread. For those who love authentic Punjabi food, check out Puran Da Dhaba, their in-house diner, inspired by a roadside dhaba, that serves yummy curries, Indian breads and desserts. 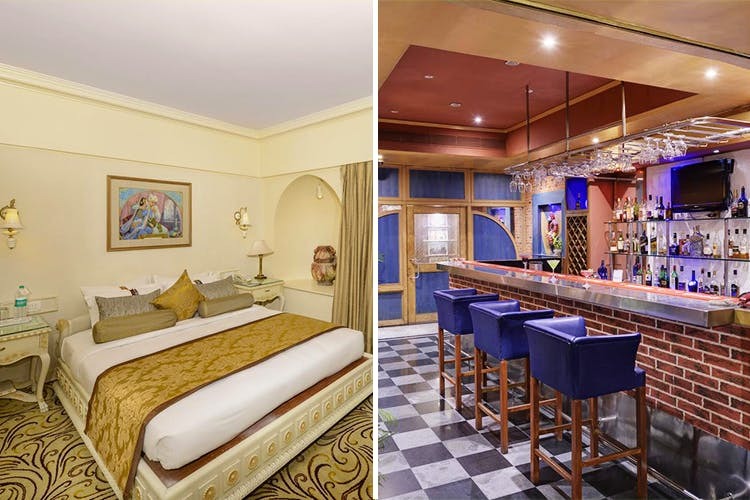 Live the royal life at The Pride Hotel in Pune.